Expressing gratitude; be it in the professional or personal sphere, always set a good impression upon the receiver. Aspiring nursing candidates would find it extremely beneficial to leave a follow-up email or note behind after the interview is over. Apart from it being a courteous gesture, a thoughtful thank you letter sets you apart from the other candidates appearing for the interview. It refreshes the interviewer’s memory and may even influence his/her hiring decision. Now, in the thank-you note, you don’t have to talk about all your qualities and achievements extensively; all that has already been covered in the interview. Just list the gist of the interview in a nutshell. That should be enough to effectively articulate your understanding of the job requirements and your interest in the said position. 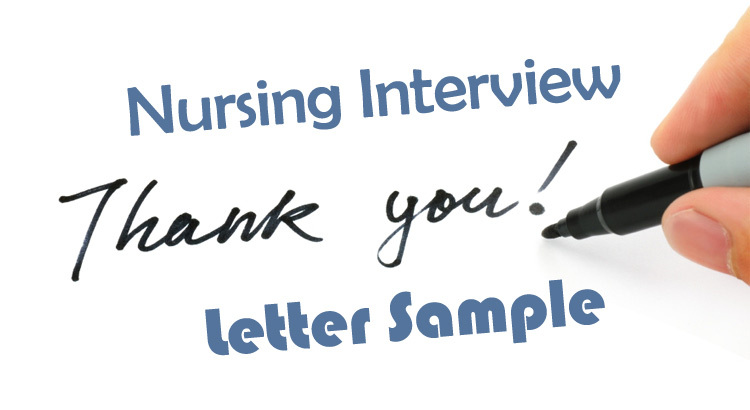 A well-written thank you letter submitted after the nursing interview works as your “marketing tool”- something that the interviewer remembers you by and might even mention when discussing you among other candidates. Double check the letter for any grammatical, spelling and other technical errors. The name of the interviewer, his designation, the company – you cannot afford to make a spelling error in any of these details. Moreover, it is always preferable that you send in a typewritten letter than just dropping by an email to the official address. Sending a hard copy of the thank you note puts forth a much stronger impression as the interviewer might even want to pull out your file, go through the resume again, to include the new document. The first part of any thank you letter re-states the purpose of the note- i.e. to express gratitude. Begin your letter with a simple, straightforward thank you to convey genuine appreciation and respect for the recipient. After that, put in a reference to the time and date of the interview in order to establish your identity in the eyes of the interviewer. Then you can go on to talk about the entire experience and what you learned from it. State the reasons why you would be the perfect candidate for the job. A thank you note is not a formal letter. Of course, the language cannot be casual and completely informal. However, try keeping it friendly, polite and real. A follow up is nothing like your resume or cover letter where you have to follow a strict structure and format. Here, you can add in a few personal moments you probably shared with the interview panel. It can be an insignificant detail pertaining to their family or their job that you can smartly incorporate in the letter. Something like, “I hope your daughter is well now, it was interesting to hear about her career as a CNA professional”. When you are talking about the interview, also try to dedicate a small paragraph to re-listing your qualifications, albeit in brief. Also, talk about your perceptions of the institution and how you can benefit from an employment opportunity there. The candidate’s ability to adapt to the work culture of the organization also plays a major role in the hiring decision. Try to draw parallels between what they want and the skills you possess. To do so, you can browse through the company’s website to learn more their business principles and values. The letter must always end on an optimistic note; it is perfectly okay to say that you would be thrilled to join the organization and contribute to it. The panel would want someone who is actually interestedin the job and has no qualms expressing it than someone who is least bothered about the company or the position offered. You can even mention in some innovative ideas or suggestions about how you would approach the new role. Try to send in the thank-you note even though the job is not right for you. The medical community is very close-knit; the interviewer may just recommend your name to others if he’s happy. Thank you for your time in our Wednesday afternoon interview. It was a pleasure to meet you and discuss the nursing position opening in the XYZ hospital (insert the name of the hospital). I take this opportunity to talk about how my qualifications are at par with the job requirements you stated during the interview. I found the job aspects you described both challenging and rewarding for my career growth. There is a lot that I can learn from working at XYZ hospital. Moreover, with my CEN, ACLS, BLS and CPR degree certifications I feel I can contribute quite a bit to your hospital as well. I would try my best to fit and be an asset to your team of medical professionals. We talked in detail about the extensive cultural diversity in the workforce, giving me some valuable insights on the values of tolerance, harmony and mutual respect. I will be honored to work in such an interesting space and open up to new experiences. Given a chance, I promise to be a competent, efficient and hard-working employee who is willing to work 3-5 extra shifts a month. Following our discussion, I walked through the hallways and was left impressed with the warmth that greeted me from every corner of the hospital. I really cannot imagine a better workspace and am very excited to join your team of talented professionals. It was a pleasure to meet the entire interview panel and have such an insightful, heartfelt conversation with the eminent professionals of the medical industry so early in my career. I look forward to hearing from you soon. Please feel free to contact me in case you some additional information.